YANGON (AFP, REUTERS) - Rising floodwaters have swallowed a Buddhist pagoda in central Myanmar and sent tens of thousands fleeing their homes, as the government warned of more heavy rains ahead. 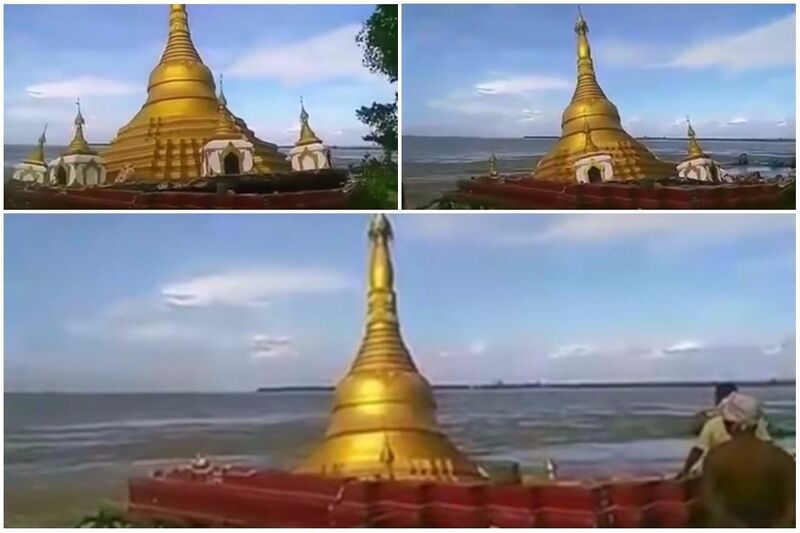 Dramatic footage circulating on social media showed the riverside, gold-leaf-covered Thiri Yadana Pyilone Chantha Pagoda sinking into the raging waters of the Ayeyarwady river in Magway region, with shocked bystanders looking on as its golden spire collapsed beneath the waves. Abbott U Pyinnya Linkkara, who filmed the footage, said the pagoda was destroyed on Thursday (July 20) last week. "This pagoda was built in 2009, when it was far away from the river," he told AFP by phone on Monday. "Year by year, the river has eroded the land and now the pagoda has fallen into the river." He said flooding was common in the area during the monsoon that runs from May to October, but this year’s floods caused alarming erosion. Some riverside villages have been washed away entirely, he said. Myanmar is one of the most disaster-prone countries in Asia, often struck by cyclones, flooding, extreme temperatures and occasional earthquakes. At least two people have died and more than 90,000 people have been displaced by flooding across central and southern Myanmar this month, according to the government. Water levels have risen steadily since unrelenting monsoon rain began to lash the heart of the country in early July, driving some people to higher land or seek shelter in Buddhist monasteries, a disaster relief official said. Most are in Magway region, where the pagoda collapsed and more than 60,000 have been forced to flee the rising waters. “The situation is under control, but what happens now will depend on the weather,” Ko Ko Naing, director general of the ministry of social welfare, relief and resettlement, told Reuters. The government's hydrology department has issued flood warnings for several townships in the coming days as strong monsoon rains continue to drench the country. The government has provided food and other assistance to a total of 116,817 displaced people by Monday, as well as longer-term shelter for those outside settlements where flood waters are not expected to subside immediately, he said. One man drowned in the floods in the Sagaing region and another was swept away while crossing a stream in Chin state, said a resettlement official in the ministry, Kay Thwe Win. A small dam also collapsed in the Bago region on Saturday, the state-run Global New Light of Myanmar newspaper reported.